Reviv Serums is a USA-based skin and haircare brand that creates innovative, groundbreaking treatment serums for hair and skin. Located in San Francisco, Reviv Serums is the innovator behind its various cutting-edge treatment lines, priced within reasonable range. Their collection of products include hair stimulating serums, shampoos, conditioners, lash serums, body sculpting serums, and more! 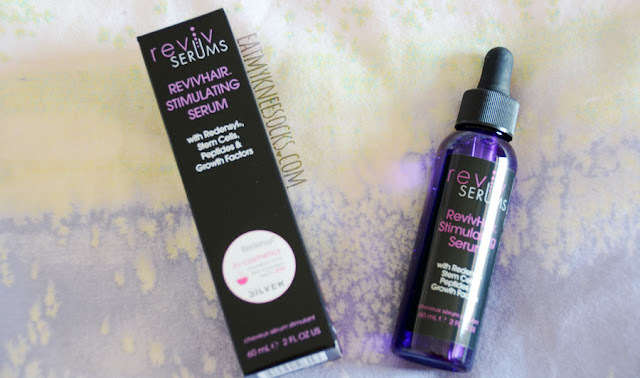 The item I'll be reviewing is their RevivHair Stimulating Serum, one of their most popular products. This serum, which can be used by both men and women, is currently on sale from its original price of $79 to $49 for a 60ml bottle, designed with the purpose of making hair fuller, thicker, stronger, and healthier. The RevivHair Stimulating Serum is targeted towards those who experience thinning, shedding, or weakening hair, and its formulated with various ingredients that are said to help reduce hair loss and promote healthy, strong hair growth. The key ingredient is something called Redensyl, which actually won the Paris 2014 in-Cosmetics' Silver Award for Best New Personal Care Ingredient. Redensyl has had great results in reactivating hair growth in prior studies, and the RevivHair serum contains various other active ingredients to aid with the process as well. 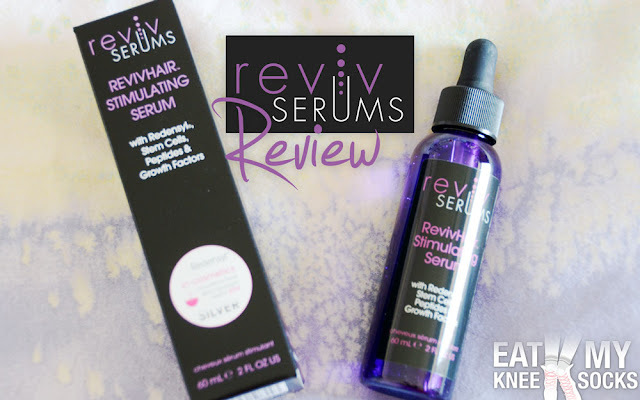 I've tried out the RevivHair serum for a few weeks now, and while it's too soon to find hair growth results, I've definitely seen improvement in the strength and fullness of my hair. 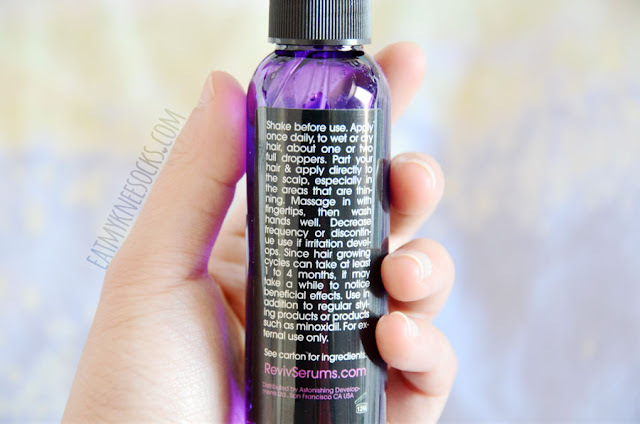 Using this serum adds slight volume to my hair, and I love that it isn't oily, greasy, or sticky at all. I've also noticed slightly less shedding. The 60ml bottle is a great starter size, but if you want long-term hair growth and significant results, you'll have to purchase more. As stated on the bottle, hair growth results may take a few months to become noticeable, which is normal for products like this. 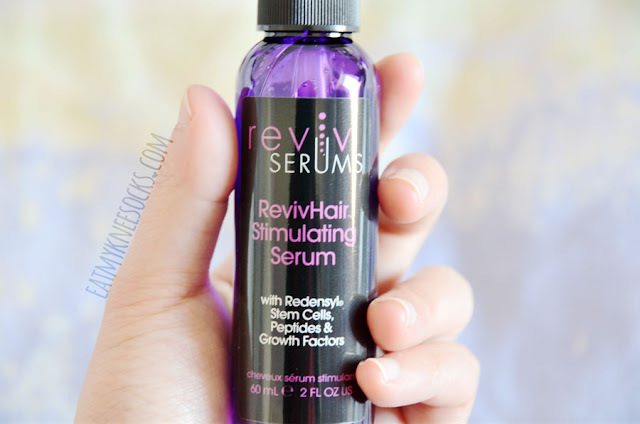 If you're looking for a solution to thinning, shedding, aging hair, the RevivHair Stimulating Serum is worth a try. Results do take time to become apparent, but even with short-term use I've seen some improvement in the look and health of my hair. I'm not particularly in need of a product like this, but it has some promising reviews and would certainly suit someone looking to regain youthful hair. This product is currently on sale for $30 less than the original price, so if you're hoping for hair regrowth and regeneration, now's your chance to test it out! Thinning hair men in men should make it a point to know all the available options that can help solve their problem. Men with thin locks suffer from this condition in either of two ways: they can be born with the problem or they might find that the problem develops gradually and slowly. Either way, they will need to make use of special haircuts in order to help minimize the effect that their slender locks have on their appearance.